Tis the season of travelling, and TRYING to travel light and pass TSA checks and all that b.s. Thus I am enthusiastic about any beauty products that come in powder form. That means you can carry way over the pesky 3 fl oz rule, be adequately ensured that you have enough in the case of an apocalypse, and avoid spills. 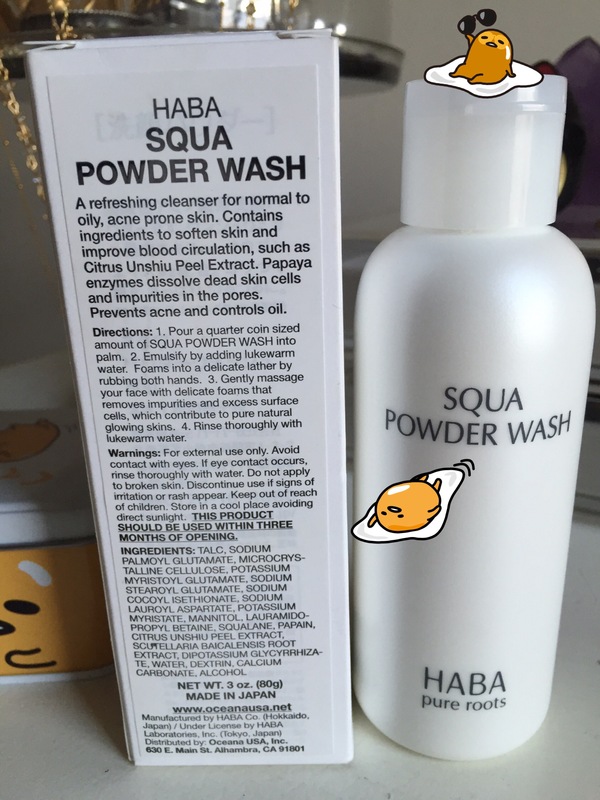 I really love the HABA (Health Aid Beauty Aid) Pure Roots line because it tends to be gentle and comes in divinely elegant and simple packaging. I’m all about packaging p0rn. 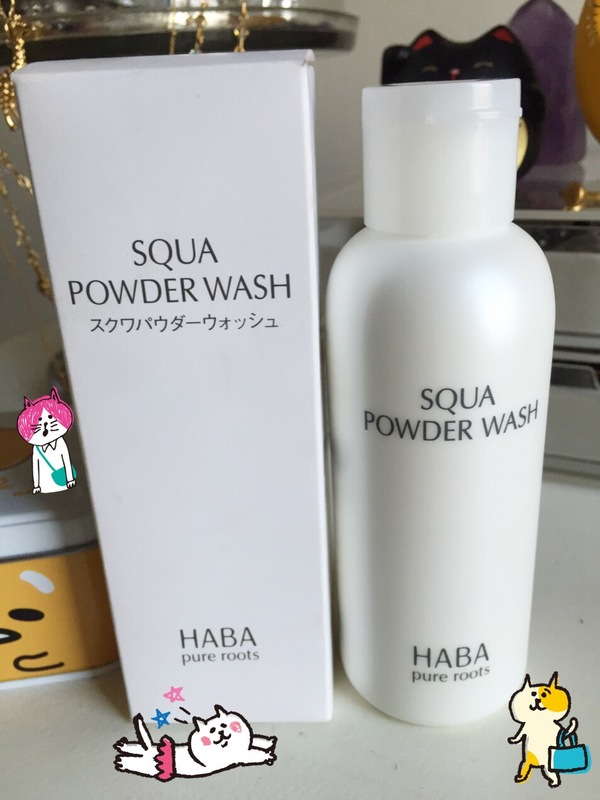 The Squa (short for squalane, a natural emollient) Powder Wash is in a simple pearl-colored bottle. It’s just big enough for a substantial amount of product, but small and light enough to carry in your purse or beach tote. I noticed that the bottle actually only contains 3oz of product, but you only need a small sprinkle of the powder each use. I expect this to last awhile. As you can see above, the ingredient list isn’t super long. It contains a bunch of “glutamates” which remind me of MSG (my Asian mother’s favorite condiment.) Strange because HABA’s new ”pure roots” skin care product line is supposed to contain no parabens, flavors, mineral oils, or other skin irritants. But the chemical-sounding names doesn’t give me much peace of mind. What it does contain that I like is papaya enzyme, which is all the rage now. Papaya is one of those miracle fruits that can tenderize meat and your face at the same time. The selling point for this powder wash is that contains a compound of amino acids with the same mild acidity as skin. This is important for those pH-stripping ladies out there, like Angela, who are very concerned about the acidity of their cleansers. The powder wash itself is supremely fine. It’s almost like the texture of baby powder. It’s the smoothest, finest powder out of all three I own. The other two are the Dr. Dream Rose Mild Natured Powder Cleanser and the Ishizawa Keana Baking Soda Scrub Wash. Of all three, I love the Dr Dream Rose the best, but they’re close contenders because this HABA Squa wash is so, so FINE. As far as the effect, it doesn’t foam that much. My face feels clean, but not stripped. Stripped is what I normally like. If I wear super industrial strength waterproof eyeliner, it barely takes any of it off. It definitely leaves residue if there’s more than light makeup. So on the one hand, it’s a great gentle cleanser. On the other hand, you will need to face wipe or double cleanse. At $19.50 a pop, I’d give it a B+. Excellent gentle acidity-friendly cleanser for sensitive skin. 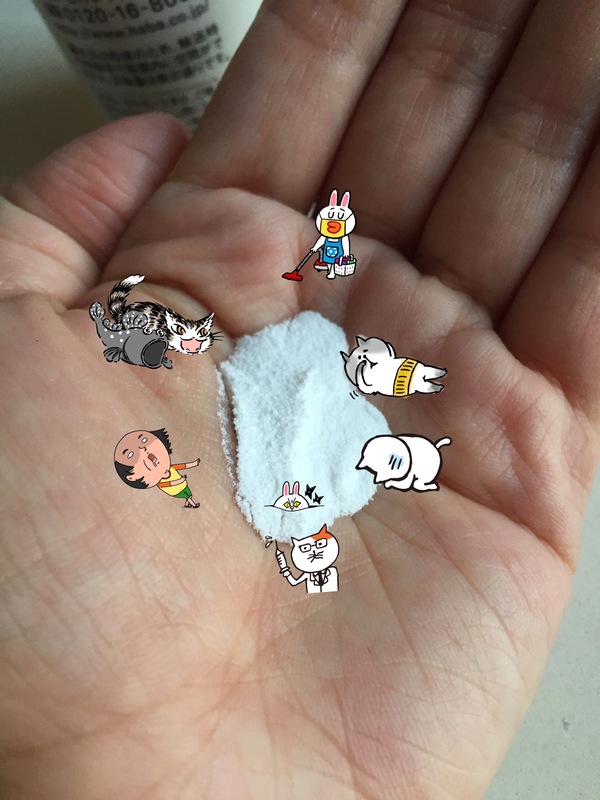 Super fine and quality powder. Good value. Pretty packaging. Reading this on my lunch break, got to “be adequately ensured that you have enough in the case of an apocalypse” and laughed. Neighbouring coworker gave me a look. What, don’t all people laugh at their computer screens? Anyway…I’ve been super interested in these powder washes too. I wonder if they’re just better used as a second step cleanser since it didn’t remove make up? The one that has a lot of hype seems to be the Tosowoong. Have you tried that, and can compare? Lol yeah of course it would be so hard to hit Asian beauty stuphs when there’s a zombie break out no? I am very curious about the Tosowoong as well. ::strokes chin:: purrrhaps I need to further research! This is amazing! Only the expiry date seems to be really conservative. I mean, three months? Would you be able to make a decent dent in the bottle?